At our dental office, we want to help you keep your natural teeth for a lifetime. When damage occurs to a tooth that’s too significant to be corrected with a filling, we may use a crown to return your smile to its perfect condition. A crown is a common dental procedure in which a prosthetic cover or cap is placed on your tooth to restore its normal shape, appearance and function after it’s been damaged. They can be made from a variety of materials and are generally colored to match the natural shade of your teeth if placed in an area that’s visible when you smile. Typically patients need a crown when a tooth is cracked or develops a cavity that is too large for a filling. Last tooth on the right: Gold Crown. Second tooth from the right: Porcelain Crown. Different types of crowns are used to meet the unique needs of your teeth. Depending on the extent of the damage, a dentist can help you decide which option is best for you. Traditional: A traditional crown covers your entire tooth. It extends all the way down to the gum line, but stays at least 1mm above the bone line to ensure that your body doesn’t reject it. Traditional crowns are usually done when there’s little tooth structure remaining or the cavity is near the gumline. Onlay or 3/4: Onlay and ¾ crowns are very similar, so they can generally be grouped together. They both cover part or all of the top of the tooth and then partially extend down the sides. The extent that they extend can vary from just a bit over one side to a significant amount over every side, depending on the severity and location of the damage. These options are typically used when the cavity is mostly on the top and maybe just some of the side. The benefit to these types of crown are that they leave most of the tooth intact on the sides, strengthening the structure. Veneers: Veneers are made of porcelain to match the natural shade of the tooth. They are typically used to change the shape, color and overall appearance of a tooth when damage occurs in areas that are seen when you smile. Think of it like a fake finger nail. You still have your original tooth underneath, but it’s slightly worn down so that a thin layer of porcelain can be laid down to obtain the aesthetic appearance that you desire. This type of crown is especially common for chips that don’t cause nerve damage, but can be seen when you smile. Different materials are used to create crowns based on your structural and aesthetic needs. Gold: The advantage to using gold alloy in a crown is that it can be made very thin but is still extremely strong. This means that it will be able to withstand long periods of wear and tear in your mouth. In fact, it wears at about the same rate as the enamel in your natural teeth. If you’re worried about the cost, you can rest easy. Gold crowns are actually comparable in price to crowns made from other materials. And yes, if the crown needs to be replaced for some reason, you can keep the gold! Porcelain: While porcelain crowns aren’t quite as strong as those made from gold, the advantage is that they can be tailored to match the natural shade of your teeth. That makes porcelain a very appealing option for your front teeth in particular, as they are very visible when you smile, but don’t receive the heavy force from chewing that your molars experience. Because porcelain isn’t as long-lasting as gold, you may need to replace the crown down the road. 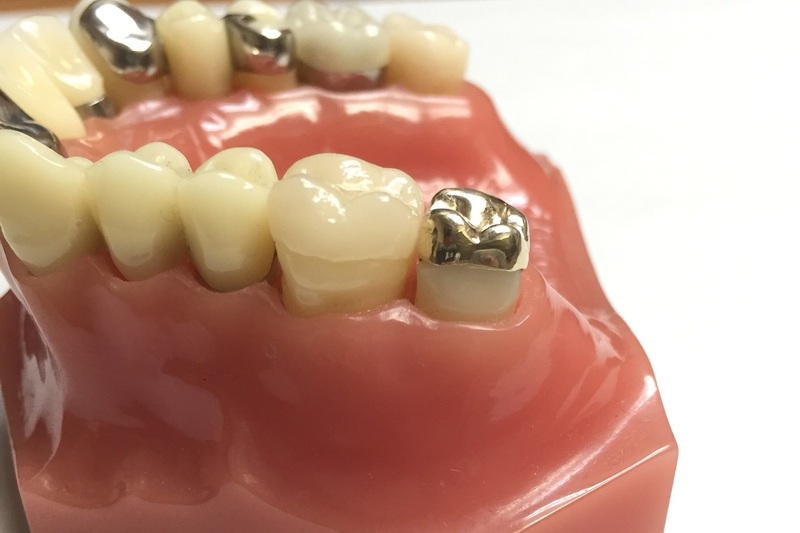 Porcelain fused to metal: Crowns made from porcelain fused to metal have many of the benefits of gold crowns, but are more natural in appearance because of the top layer of porcelain. The bottom layer of metal gives the crown strength, but is not visible. While these crowns were once very popular, they’re increasingly being replaced by the gold and porcelain options and are rarely done at our dental office. A crown with Dr. Z. When you come into the office with a dental problem, Dr. Zufall will assess the damage to determine if a crown is the right next step for your oral health. If he feels that it’s the appropriate decision, he will discuss your options and answer any questions you may have to help decide the best solution. Getting a crown can take two appointments or in many cases just one. We use CEREC technology to make custom crowns right here in the office in a single visit. To learn more about them check out our video and blog posts. With a two step crown the first appointment your tooth is prepared, an impression is taken and a temporary crown is put into place. Once the crown is made from the impression, you’ll come back in for a second appointment and the temporary will be removed and the permanent crown put into place. Concerned about the price of a crown? At our office, we work with a private financing agency and your insurance provider to figure out a payment plan that fits your needs. We prioritize transparency and value in our office, and we’ll do our part to make sure you receive the best possible care at a price you can afford.